Ball State comes to town at a perfect time for Oklahoma. 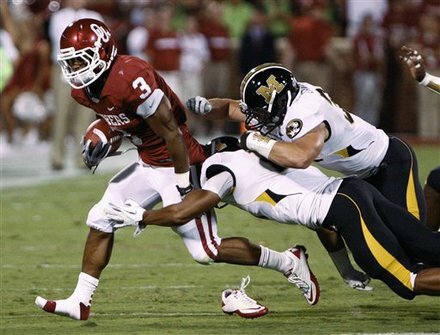 There is consensus that the Sooners didn't play to their potential against Missouri from media and players alike. Frankly, Ball State is "that game" on the schedule every year that everyone knows is a gimme. If there's to be any lack of motivation during a game this year, it should be this one. However, with the Red River Rivalry coming next week and the disappointment from the Missouri game still fresh on the Sooners' minds, this game will probably be more intense than we'd normally expect. That's bad news for the innocent Cardinals, who have posted a 3-1 record thus far this year, including a win against former OU offensive coordinator Kevin Wilson's Indiana Hoosiers. This could, and should, get ugly. Receiver Kenny Stills is back and Jaz Reynolds is building confidence coming off his career-high 93-yard performance against Missouri. It's safe to say that the Cardinal cornerbacks haven't met a passing offense like this before. Running back Brennan Clay has mentioned that he's extra motivated as a result of his lower-than-expected rushing production. This could be an excellent game for him to break out. The OU defense should be able to contain anything the Cardinals' offense throws at them. Ball State ranks 59th and 60th in rushing and passing yards, respectively. Outcome: The Sooners awake out of their stupor and strengthen up in a prep game for Texas. Landry Jones and the first team don't play in the fourth quarter. OU big, 62-10. Can OU come out flat yet again? It will show a complete lack of respect for the game if that's the case. Cardinals quarterback Keith Wenning has a 73 percent completion rate and no interceptions yet this year. Five Ball State receivers have had a double digit number of catches in a game. The Cardinals' duo of running backs have been productive as well, so the offense could potentially eat some clock. Cardinals safety Sean Baker is the Ball State career leader in interceptions. Outcome: Sooners annoy the hell out of everyone, stumbling and bumbling all night. Nevertheless there's too much talent deficit. OU wins 42-21. Texas game looks more formidable.